Twitter and TV reports are coming in with news of a disgruntled Londoner with a DIY bomb strapped to his body. What does he want? Nobody knows. But he has hostages, and the police have him under siege. Twitter, as usual, is adding a swirl of at times conflicting information (fist shake), but we're going to do our best to whip it all into something coherent. For now, know this: a jury rigged bomb made of clustered gas canisters, hostages, man, not a terrorist, in London. The standoff has been going on for two hours, and Sky News reports the severity of the incident as a "9 out of 10," whatever that means. Update 1: Sky News says the man is throwing out office paperwork from a high floor of the building he's holed up in. Not exactly a stable brain to negotiate with. Update 2: It's important to keep in mind that even if the man is killed, the alleged bomb or "gas canisters" strapped to his leg(s) could still detonate. 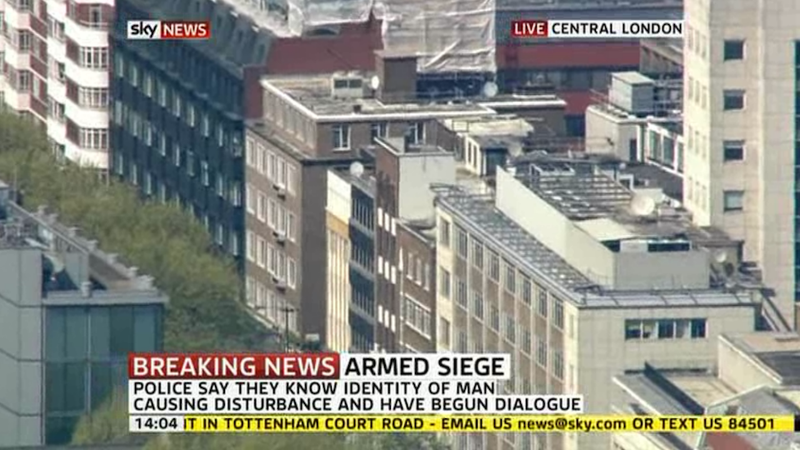 Update 3: Sky News shows police snipers ready to shoot. Update 4: Sky News says the man might have been sent into this frenzy after being denied an HGV (Heavy Goods Vehicle) drivers license—and this may indeed be the office he's taken tenuous control of. The captor has now been in place for 2.5 hours with around four hostages. Update 6: The man has apparently thrown "office equipment" out of his window, including chairs and filing cabinets. Update 7: This woman was present in the office when the unhinged man first entered. Update 8: Police have identified the culprit as 50-year-old Michael Green. Mike, don't do it! Update 9: CNN reports the culprit has been arrested.